Features: 'Optical Stabilization' - 'ID' (Incline/Decline) - 'Locked On' - 'First Target Priority' Technology! Perfect for hilly courses! 'Hyper Read' fast and accurate Slope-Adjusted Distance with 8 second continuous measurement. Waterproof & Fogproof! Nikon has combined its sophisticated range finding technologies with the groundbreaking Optical Stabilization for more precise ranging in the COOLSHOT 80i VR Pro Stabilized Laser Range Finder. Golfers are constantly facing nerves, rushing adrenaline, fatigue, varying temperatures, wind, out of balance positions and tournament pressures. Now golfers can put fast, precise, solid target acquisition into their own hands - whether shaky or steady, with the COOLSHOT 80i VR Pro Stabilized LRF. The new COOLSHOT 80i VR PRO STABILIZED provides unshakable confidence to golfers who rely on accurate distance measurements before taking that next shot by reducing external vibrations caused by inadvertent hand movements while ranging objects. The COOLSHOT PRO STABILIZED allows you to acquire small objects faster, then direct the laser to the target more accurately. Measurement range 8-1200 yards. Incredible Accuracy: Accurate to 3/4 of a yard, inside of 700 yards, 1.25 yards beyond 700 yards. Multi-Layer Coated Lens | 6x21; 7.5 deg. Vibrations of the image in the viewfinder caused by hand movement (sinusoidal waves) are reduced to approx. 1/5 or less. (Based on Nikon’s measurement standards). Displays measurement results in approx. 0.3 seconds – regardless of distance. When 'ID Technology' mode is selected, COOLSHOT PRO STABILIZED displays the slope-adjusted distance (Horizontal distance ± Height). The Green LED Actual Distance Indicator light blinks as long as the power is on. The Slope (ID) feature can be turned off, which simultaneously turns off the Competitive Confirmation indicator. A green circle visually shows the distance is to the closest subject, the flagstick. With this feature, you have the ability to know everything you need to know as you approach the green, and target the cup. 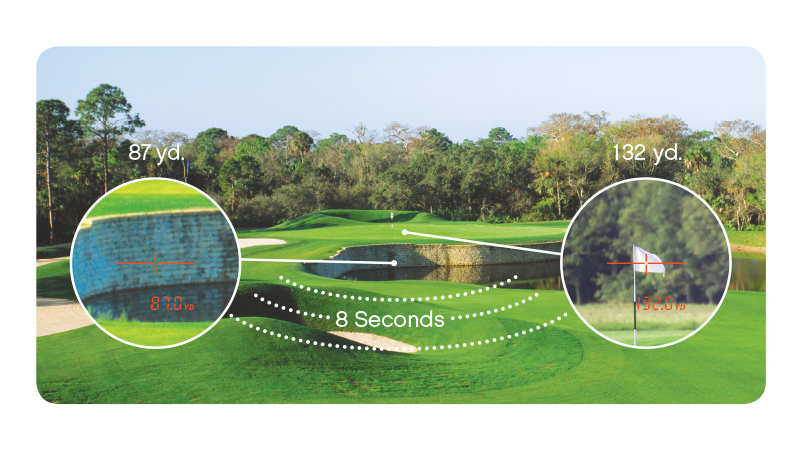 Press and hold the power button and the rangefinder will continuously measure range for eight seconds to find measurements of multiple or very small or thin objects, allowing you to know the distances to hazards, pins, mounds, and trees. Red and green OLED display provides automatic brightness adjustment for ideal visibility. Integral monocular features multicoated optics for bright clear viewing and rear diopter ring for fast focus. Designed to be extremely lightweight and compact; able to withstand even the worst conditions. The COOLSHOT PRO STABILIZED is waterproof, not just water resistant or rainproof, and also fogproof - nitrogen filled to eliminate internal condensation. TO ORDER: Select Qty & "Add to Cart"
| 7.5-915m / 8-1,000 yds.